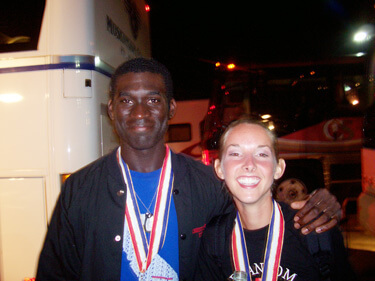 Christopher Agwu, a 2006 member of Phantom Regiment, sent this picture. This is a picture of my great friend Tricia and me. We went to high school together, and I got to march with her in the summer of 2006. Her first summer with Phantom Regiment was in 2005, and in San Antonio, she asked me to try out for Regiment. She talked about how great it was, and I was pretty much sold. It also was her ageout year in 2006, and I thought it would be cool marching with her for at least one summer. Tricia is one of the main reasons I marched with the amazing Phantom Regiment. The summer of 2006 was probably the greatest summer of my life. Amazing music. Amazing friends. An amazing show.